Colossus actor Stefan Kapicic confirmed in a new interview that Shatterstar is in Deadpool 2, which may or may not be called Untitled Deadpool Sequel since we have not seen anything else in regard to an official title. However, the first Deadpool 2 trailer arrived last week, and fans have been picking it apart, trying to find all of the Easter Eggs contained in the short clip. A few eagle-eyed sleuths were able to see that Terry Crews, possibly as G.W. Bridge, in the helicopter scene and thought that they saw Shatterstar behind Crews. As it turns out, they were correct, according to Stefan Kapicic. In a new interview, Colossus actor Stefan Kapicic not only confirmed that Terry Crews is officially in Deadpool 2, but also that Shatterstar is in it as well. Kapicic did not confirm who the actor was and did not mention what character Terry Crews is playing in X-force. He had this to say in reference to the trailer. "That's not CGI of Terry Crews, that is Terry Crews. You can see it clearly. You can see behind him, Shatterstar, a really cool thing for people to geek out." 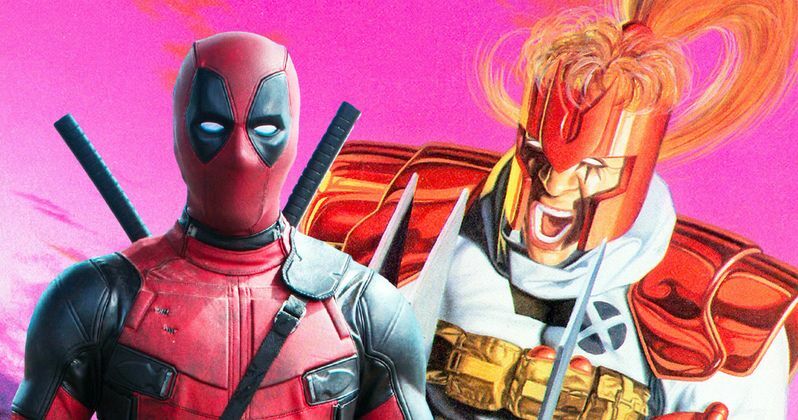 Fans have been speculating since last summer that Shatterstar was going to be in Deadpool 2, which co-writer Rhett Reese flatly denied at the time. It seems that Reese was just trying to keep a secret when he was initially asked about the inclusion of the character. In the comics, Shatterstar is closely linked to Josh Brolin's Cable character. Shatterstar is a deadly warrior who was trained in martial arts in another dimension, where he originates from. His main weapon is a double-bladed sword that can be charged to send devastating shockwaves. Shatterstar is also known for his distinctive costume, which most notably includes a weird helmet design that can clearly be seen behind Terry Crews in the trailer. It's been rumored that Iron Fist's Lewis Tan is playing Shatterstar, but that has not been confirmed at this time. There's also a rumor going around that IT's Bill Skarsgard is shown in the same scene, behind Zazie Beetz's Domino character, which has led to questions of what exactly we're looking at. We could be looking at Cable's Six Pack, aka Wild Pack, or we could be seeing X-Force. Or better yet, Deadpool 2 could be taking a mixture of both groups for the story, since the members seen in the helicopter scene are a part of both groups. X-Force seems like the safe bet, especially since the X-Force movie is currently in pre-production. Stefan Kapicic also spoke about the dynamic between his character and Ryan Reynolds' Deadpool in the new movie, stating that Colossus is trying to make Deadpool a better person. Meaning, Colossus wants Deadpool to stop acting like a child all of the time, which doesn't seem to be working out so well in the new international trailer for Deadpool 2 where Wade Wilson is shown grabbing Colossus' backside. While there's still a lot that we don't know about the untitled sequel, we now know that Terry Crews is confirmed along with the inclusion of Shatterstar. You can read the rest of the interview with Stefan Kapičić over at Inverse.